Pallid Cuckoos are a pale grey cuckoo found through Australia and can be common in some areas. They tend to spend the winters inland and move south and towards the coast for the breeding season from spring to early summer. As with most cuckoos, they are nest parasites, usually tending to pick on Willie Wagtails and robins. They remove an egg from the nest, replacing it with one that is similarly-coloured and patterned. The cuckoo chick hatches and pushes the remaining eggs and chicks out of the nest and works the adoptive parents very hard as the much-larger cuckoo requires a large amount of food. 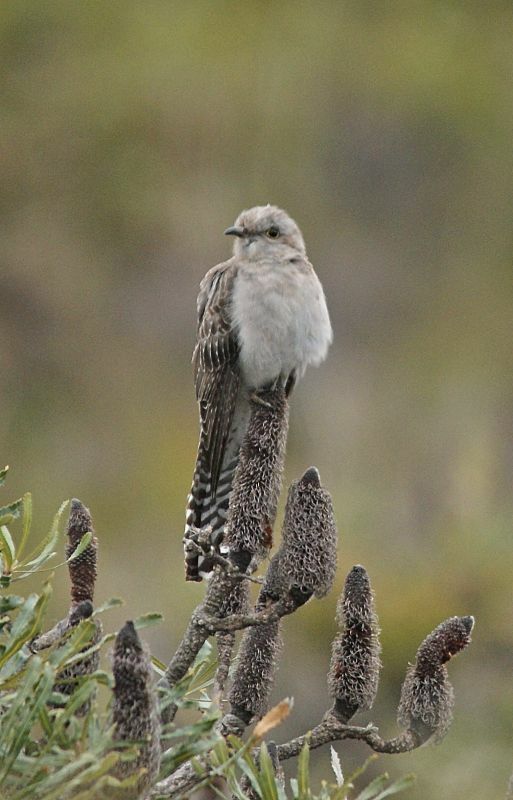 Adult birds are 28-33 cm in length, making them the largest of the cacomantis cuckoos in Australia, although they wer until recently thought to have been in the genus cuculus. 1: Cheynes Beach, WA, 29/09/2012.